What Did I Struggle With When Learning the Flute? 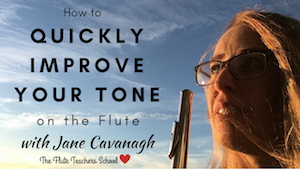 A few weeks ago, someone asked me the question "So Jane, what did you struggle with when you were learning the flute?" Things I KNEW I was doing wrong, but didn't know how to fix them. Things I had NO IDEA I was doing wrong until a teacher fixed them for me! I made you a 5 minute video here to tell you exactly what these struggles were. I just made the video so you to know that no one is born being able to play the flute well. It's always a step by step process of getting a little bit better at a time. And that's how I love teaching! Step by step improvements that all add up to big, big changes.